Inspired by What She Reads, Pure Imagination Blog, and Stacked. I admit I’m a book cover snob. Who isn’t though? Book covers are the first thing that attracts readers to a book. A good cover can draw someone is, just as a bad cover can easily draw someone away. It can essentially make or break a book. Holy, Mother Cover! is where I showcase the book covers that stand out (or make me cringe), and discuss cover changes. What I love about the US cover of This Savage Song are: the font (which has a chalky-paint quality) and its loopiness, the violin outline that gives an opening to a city alleyway (as if saying that you can find the music there), and the orangey-red coloring. You just feel like something isn’t right. Final Verdict: What cover do I like better? The hardcover! Which cover design do you prefer? 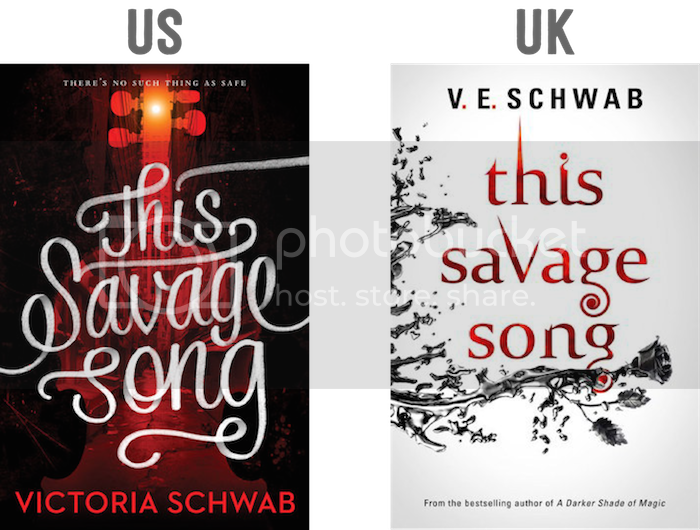 Would you buy the book for the US or the UK cover? I usually prefer UK covers, but in this case I like the US cover design a lot more! I like the US edition more because of, like you mention, the chalky font! The UK cover reminds me of Jay Kristoff’s Nevernight. The U.K. cover kind of uses the *classic vampire novel* script on the front too. While it is kind of a vampire novel… I think over all the U.S. cover suits the story better! I have to be the black sheep and go with the UK cover for this one! I think it looks cleaner and I love the rose imagery and simple color palette! Wow. I usually like UK versions better but in this case I like the US one. I definitely prefer the US cover! It’s so unique and haunting, and I think the atmosphere of the cover matches the atmosphere of the book really well. To me, the UK cover screams “paranormal romance!”, which. . . is really not indicative of the book at all. I like the US cover better, but the UK one isn’t bad either. I like the US cover a lot more! The UK one is so bare and I honestly would probably glance over it at first.